Note: There are two somewhat significant updates at the bottom, just before the Appendix. CAFE stands for Corporate Average Fuel Economy – the average fuel efficiency that is calculated annually for every manufacturer that sells cars or light trucks in the U.S. and compared to standards set by the National Highway Traffic Safety Administration, part of the Department of Transportation. (If you want to know more about how CAFE is measured, see the Appendix to this post.) Yesterday, President Obama proposed new, higher CAFE standards for models years up through 2016, by which point aggregate efficiency should reach 35.5 miles per gallon. The typical conservative response to regulations like this is that they impose costs on the economy. In this case the main argument is that mandating higher fuel efficiency standards makes cars more expensive to produce; so car companies have to charge more for them; so fewer people will buy cars, and fewer people will be employed in the auto industry. I was planning to try to pre-empt this argument, but Keith Hennessey, former head of the National Economic Council under Bush II, beat me to the punch. His post summarizes some findings from a 900-page report produced by NHTSA in January 2008, when the Bush administration released the latest version of the CAFE standards. One of his main points, taken from that report, is that the Obama standards will cost 49,000 jobs. That’s relative to some baseline that I haven’t been able to identify, but it’s 38,000 jobs more than the Bush standards. The table is on page 586 of the long report; the Bush plan is “Optimized” and the Obama plan is “TC = TB.” Hennessey’s post has been picked up by Marginal Revolution (where I found it) and by The New York Times, so I decided I should stay up late and write a response. Hennessey’s insight was to notice that the Obama plan looks similar to a plan analyzed under the Bush administration – TC = TB – and rejected in favor of Optimized. If you look at the first chart in his blog post you’ll see why he makes this guess, and it seems good to me. Based on that assumption, he can take the NHTSA’s analysis of the TC = TB plan and apply it to the Obama plan. The Optimized plan is the one that, according to the analysis, maximizes net benefits to society – that is, benefits of the regulation minus costs of the regulation. The TC = TB plan is the one that gets the highest fuel efficiency while ensuring that the net benefits are not negative. The conceptual idea is that there is that there are diminishing marginal net benefits to higher fuel efficiency – you use less fuel and emit less carbon dioxide (“CO2”), but it gets more and more expensive to squeeze more efficiency out the engines, so the cars cost more and more. I acknowledge this point, but I don’t put a lot of faith in it, because the calculation of benefits is highly dependent on your assumptions, such as the price of oil and the monetary value of reducing carbon emissions. In this study, the NHTSA used a range of $0 to $14 per metric ton of CO2, and used the midpoint ($7) in its estimates. The higher your estimate of the aggregate cost of CO2 emissions, the higher your optimal fuel efficiency standards will be. The argument that higher fuel efficiency standards reduces jobs goes like this. The diagram below shows the market before regulation. Auto companies will supply cars at some price that includes their cost plus the profit margin they need to pay off their debts and provide a return to their shareholders. 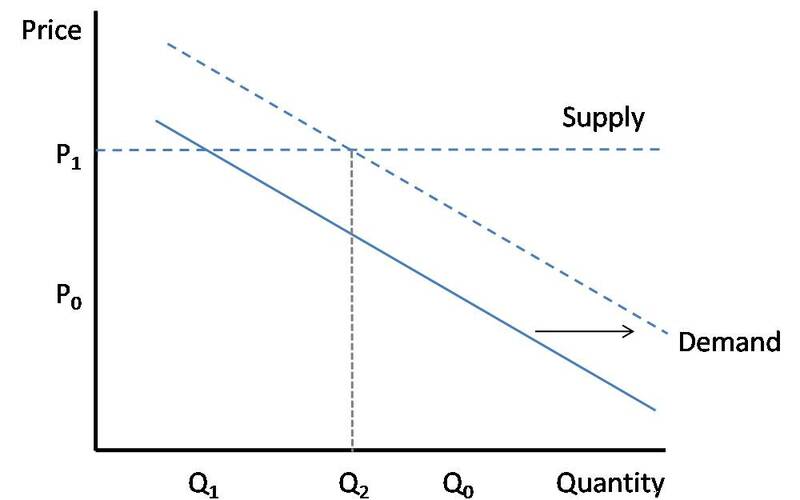 (You could draw the supply curve with an upward slope and everything that follows would be essentially the same.) The more expensive the car, the fewer people will buy it. At equilibrium, the price is P0 and Q0 cars will get produced and sold. Then regulation comes along, increasing costs for car makers. The Obama people have been using the number $1300, so let’s use that number. This acts something like a tax. The price charged goes from P0 to P1, where P1 = P0 + $1300. At the higher price, fewer people will buy the car, so quantity declines to Q1. Fewer people get cars (bad) and fewer cars get produced, meaning fewer jobs in the auto industry (bad). However, there are two problems with this argument in its simple form. The first problem is that it isn’t the same car – now it’s more fuel efficient. That’s good, and it means that people will be willing to pay more for it. 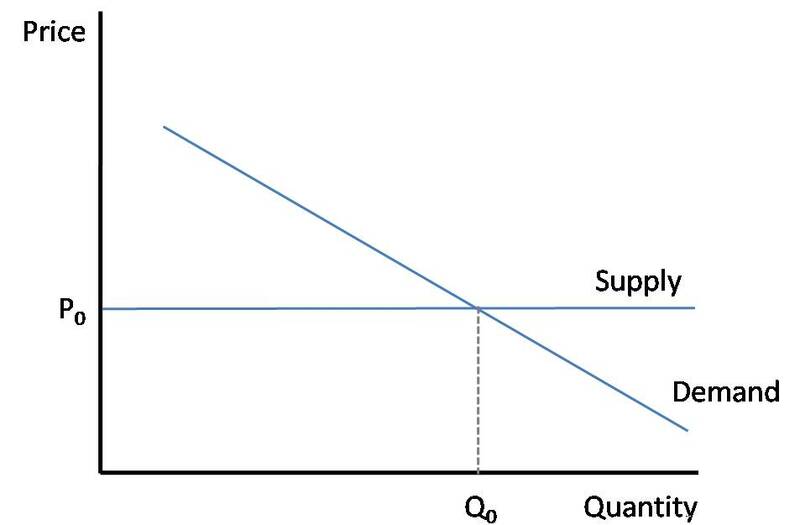 In other words, the demand curve shifts outward, so at equilibrium, quantity will be Q2, which is somewhere between Q0 and Q1. Q2 will still be less than Q0; otherwise, the free market would have come to that equilibrium by itself. (If people valued the increased fuel efficiency at $1300 or more, the industry would already have done it, at least according to a pure free-market argument.) So things are not as bad as in the picture above. The other thing is that there is actually $1300 of additional stuff in the car, which someone has to build. So even if fewer vehicles are being made, they are not the same vehicles. If we take manufacturing cost as a proxy for labor inputs throughout the entire supply chain, then these vehicles require more labor than the pre-regulation vehicles. (You could say that you get the increased efficiency from more sophisticated components – but someone has to design and build those components, and if they were as easy to design and build as the less sophisticated components, then they wouldn’t cost any more.) So as a crude approximation, in the pre-regulation world the auto industry employs B + C people, while in the regulated world it employs A + B people. And there’s no way to tell from a conceptual drawing which is greater. That’s the theory. But how do things work out in the real world? First I’ll look at the consumer side, then I’ll return to the production and jobs side. The first thing to note is that the manufacturing cost of every vehicle will not go up by $1300 – that’s just an average. It’s also not as simple as saying that the manufacturing cost of gas guzzlers will go up more and the cost of fuel-efficient vehicles will go up less, because car companies can meet the standards any way they want, and increases anywhere in the fleet help. (They can’t just change their mix, as explained in the Appendix.) All other things being equal, you would expect more investment to go into the gas guzzlers, because the marginal returns to investment should be higher than in the Prius; but other things are not equal, like maybe the marginal bit of engine efficiency gets you more bang in the Prius than in a pickup truck, because it is already lighter and more aerodynamic. On top of that, car companies have sophisticated pricing strategies that involve all sorts of cross-subsidization. For example, American manufacturers until recently sold small cars at small profit margins while selling large cars and trucks at huge margins. All other things being equal, you would expect them to discount the more efficient models and increase prices on the less efficient models with the same footprint (see Appendix), because that would have the net effect of increasing their CAFE, but again many things are unequal. But let’s assume that prices will go up by some amount. Does that mean that fewer people will be able to afford cars, as implied by the diagrams above? Maybe. The flaw with all those diagrams is that they assume that there is only one car at one price, when in fact there are dozens of models, each with dozens of potential variations, all at different prices. For example, let’s say that in an unregulated world you would buy a top-of-the-line Toyota Camry XLE, with an MSRP of $25,575. Whoops, everything is now $1300 more expensive (let’s assume). Are you going to switch to mass transit? No, but you could switch to the Camry LE V6, which is $1300 less than the XLE. Or you could give up the navigation system, which has an MSRP of $1200. Or, if you want all the options, you could switch to a Ford Fusion, which is a little less expensive than a Camry, but which I hear is a very good car. So would fewer new cars actually get sold? Maybe, at the margin, there are some people who are already buying the very cheapest new car out there (or the cheapest model in the class they need), and will be forced out. However, it is also possible that one or more manufacturers will come out with an even cheaper car to supply them – or simply keep a low-end model or two in their existing form, without additional manufacturing costs. In any case, the net effect should be smaller than in the theoretical one-model world, where there is no ability to switch into a cheaper substitute. And, to take a normative stance for a minute, it’s not as if this is perpetrating some great injustice on the American consumer, like forcing people to take mass transit. There is a big used-car market in the U.S. (where my family has bought two of the three cars we have ever owned), and, believe it or not, there is no Constitutional right to a new car. Theoretically, increased prices for new cars could ripple into the used car market – eventually – but you can still substitute into slightly cheaper models. At the bottom end of the spectrum, people who can barely afford any car are looking at things like my 99 Chevy Prizm – and I doubt that new CAFE standards are going to boost its resale value by more than a few cents. So, I think I’ve outlined a number of reasons why job losses should not be as great as in a crude “$1300 tax” analogy in a world where only one car model exists: demand for cars will go up because they are better; there is more stuff in the cars that has to be built; and people can substitute into different new cars instead of being forced out of the new car market. The fact remains that the NHTSA report cited by Hennessey estimates 49,000 job losses relative to the baseline scenario which, I assume, is the world prior to the 2008 Bush Administration change to CAFE standards for model years 2011-15. So we need to look at what’s behind that number. The calculations assume that compliance costs are passed onto consumers in the form of higher prices. These higher vehicle prices (net of the benefits of added fuel savings and added resale value) lead to reduced demand for vehicles. Estimates of sales losses are made using the price changes and the elasticity of demand for new vehicles (-1.0). Losses in sales are translated into losses in jobs by dividing through by the average number of vehicles produced per full time jobs in the automotive industry (approximately 10.5 vehicles per job). So it looks like they did take into account the fact that the vehicles are worth more. Another thing to note is that the estimate covers the entire auto industry, so the 49,000 jobs number includes overseas jobs; the number of domestic jobs would be considerably lower. But it’s not clear whether there is one model with a single type of car, or a more sophisticated model. The main report cites Chapter VII of the Final Regulatory Impact Analysis (FRIA), which I cannot find on the NHTSA web site. I am looking for the FRIA for the Final Rule for model years 2011-15, which became effective in January 2008. I can find something called the Preliminary Regulatory Impact Analysis for those model years, which is actually dated April 2008, and is probably pretty close. A sample calculation for Ford passenger cars under the Optimized 7% alternative in MY 2011 is an estimated retail price increase of $782, which is multiplied by 0.911 [to reflect the increased resale value of the car, less some increased costs of ownership] to get a residual price increase of $712. The estimated fuel savings over the 5 years of $281 at a 3 percent discount rate results in a net cost to consumers of $431. Comparing that to the $21,821 average price is 2.39 percent price increase. Ford sales were estimated to be about 1,300,000 passenger cars for MY 2011. With a price elasticity of –1.0, a 2.39 percent increase in sales could result in an estimated loss in sales of 3,104 passenger cars at a 3 percent discount rate. So the model assumes a world where every manufacturer makes exactly one passenger car and one light truck and applies a price elasticity of -1.0. Now, it’s possible that that price elasticity was estimated using a similarly aggregated model of the world, so perhaps this approach is accurate. But I’m also worried about the $782 estimate for retail price increases. The methodology for estimating manufacturing cost increases is complicated, to say the least. It is based on estimates of the cost, effectiveness, and availability of specific new technologies (pp. 88-93). Then these are applied to data from the manufacturers about their production plans (see pages 126-28). As far as I can tell (I admit, I didn’t read every word), the algorithm takes these car company plans as a given, meaning that it does not allow them to shift their production plans in response to changing CAFE standards. This seems unrealistic to me. There are three potential areas of employment that fuel economy standards could impact. The first is the hiring of additional engineers by automobile companies and their suppliers to do research and development and testing on new technologies to determine their capabilities, durability, platform introduction, etc. The agency does not anticipate a huge number of incremental jobs in the engineering field. Often people would be diverted from one area to another and the incremental number of jobs might be a few thousand. The second area is the impact that new technologies would have on the production line. Again, we don’t anticipate a large number of incremental workers, as for the most part you are replacing one engine with another or one transmission with another. In some instances the technology is more complex, requiring more parts and there would be a small increase in the number of production employees, but we don’t anticipate a large change. It seems to me that they are ignoring the fact that more complicated, more expensive cars with more stuff in them require more labor to build. Essentially, this study is saying that it will cost more to build more fuel-efficient cars because they require new technologies that must be developed and manufactured at a higher cost than the old technologies – yet those new technologies and components will not employ any more people than the old technologies. If they don’t employ any more people – anywhere along the supply chain – why are they more expensive? I doubt that the new technologies use more iron or copper than the old ones; if the increased value doesn’t come from raw materials, it must be added by people, somewhere along the line. A little might go to intellectual property licenses, but that can’t amount to all of the incremental cost. Anyway, something seems deeply wrong to me here. In short, this approach denies that box B on my last diagram has any impact on employment. In the end, I’m willing to acknowledge that higher fuel efficiency standards should mean slightly lower new car sales, which could lower auto employment a little. But the 49,000 number is definitely high for at least two reasons: (a) it ignores the additional jobs required to build more complicated, more expensive cars; and (b) if you’re looking at this from a U.S. standpoint, it includes foreign automakers. And it may be high because it doesn’t fully reflect substitution between car models, either by manufacturers or by consumers. I have something to say about the environmental impact as well, but that will have to wait for tomorrow, as this is already my longest blog post ever. Update: Lying in bed last night, I changed my mind. I’m not willing to concede that higher fuel efficiency standards mean fewer auto industry jobs; they might, but it’s not certain. The elasticity of a product is the amount that purchases of that product will change in relation to changes in its price. We say that gas and cigarettes have low elasticity: double the price of gas, and people will still buy almost as much of it; the same goes for cigarettes. 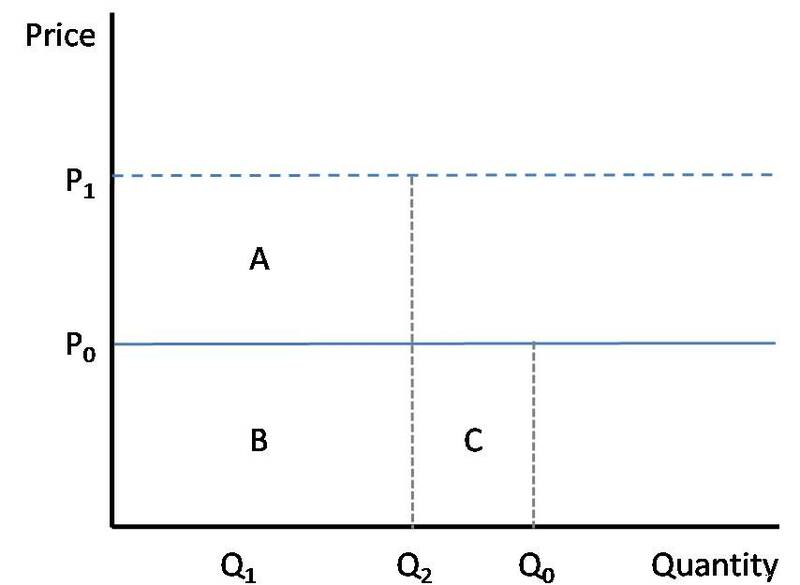 Elasticity is expressed as the ratio of the proportional change in sales to the proportional change in price. So if the elasticity of cars is -1.0, that means for a 3% increase in price, you will get 3% fewer cars sold. The implication, which I missed last night, is that almost the exact same amount of money gets spent on new cars (1.03 * 0.97 = 0.999) – there’s just more money per car. If the price goes up because manufacturers are able to raise prices, keeping the cars the same, then more money (per car) goes to their profits, so employment can go down. The same thing is true with a tax, where more money goes to the government. If the price goes up because the cost of steel goes up, then more money goes to steelmakers, so employment in the auto industry can go down. In this case, though, the price increases are because the cars have more car stuff in them, increasing their manufacturing costs. So the amount of money being paid into the auto industry is the same and the profits are the same, and money going to raw inputs is the same. So auto industry employment can only go down if labor’s share of costs goes down, or if per-worker compensation goes up. In the absence of a reason why one of those should be happening, I don’t see why employment would go down. Also, thanks to Oliver, I fixed a typo in the first paragraph – 2006 should be 2016. Update 2: RJ raised the safety question in this comment. Dominic J, winstongator, odograph, and StatsGuy responded in replies (directly below the original comment), saving me the trouble of doing the research. Thanks. There are many things I didn’t know about CAFE until I did the research for this post. Here are three that may be interesting. 1. CAFE does not fall into the miles-per-gallon trap. If you take two cars, one that gets 10 mpg and one that gets 20 mpg, and drive them the same distance, you will not get an overall average mpg of 15; you will get 13.3. Try it yourself if you don’t believe me. You do not have this problem if you use gallons per mile instead; in that case your two cars would use 0.1 and 0.05 gallons per mile, and on average they would use 0.075 gallons per mile, which is exactly what you would expect. where N is the total number of cars, Ni is the number of model i, and MPGi is the MPG of model i. It says it uses MPG, but if you stare at it long enough you’ll work out that the denominator of the fraction is calculating how much gas it would take to drive every car one mile, which is a gallons-per-mile calculation, and everything works out. 2. There is a different standard for each vehicle “footprint,” which Hennessey helpfully defines as “the shadow made by the vehicle when the sun is directly overhead.” So if you have bigger cars, you are allowed to have lower gas mileage. One implication is that you can’t meet higher CAFE standards simply by dropping SUVs and increasing sales of small cars, since your aggregate standard (that you have to meet) is a weighted average of the standards for each of your models – weighted by the number of each model that you sell. 3. CAFE compliance is based on actual vehicle sales, not predicted sales. I was a little suspicious about this. This entry was posted in Commentary and tagged auto industry, environment, regulation. Bookmark the permalink. The automakers’ lack of political clout made it possible to create new CAFE standards without a major public opposition. Is there anyone who thinks this would have been easy if it were regulating the banking industry? Do we have to wait until the government allows Wall Street to fail as badly and for as long as the American auto industry before we can get serious reform? 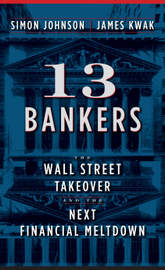 Can reform come in slow stages or do we have to wait until American banks are no longer #1? First, isn’t it possible that better gas mileage will simply encourage people to drive more? Might a higher gas tax not be more effective? Secondly, a cost/benefit analysis seems rather pointless when the actual costs of increased oil usage, particularly in regards to the environment, have no real upper bound. I appreciate the good work you do explaining the economy; I find this blog insightful and well informed. Even so, you seem to have a typo at the end of the first paragraph of this post– I can only assume Obama is not trying to regulate 2006. . . unless I am missing something. Keep up the good work. We will have a technological change and a price change, without a functional change. A car and truck will still be a people and goods transporter. Analyses at this point, prior to actual vehicle prototypes, are assuming that carrying capacity in both weight and cubic feet will remain unchanged. However, this is speculative and carrying capacity may reduce per vehicle or on average. Vehicles are functionally used for business transport and multiple passenger transport. It is too early to speculate on the physical vehicle changes and the effect they will have on number of cars/ truck needed in actual life situations. Prius and Insights are nice cars, but after a school sporting or social event, you need more of them to transport the kids home or to pizza, than if larger, less fuel-efficient 6-9 seat SUVs were used. Splitting a passenger to put into two cars is not a practical option. A similar logic applies to some cargo. Are there analyses of fuel use inputting real life situations to see what combination of old and new cars/trucks use the least fuel in actual, everyday usage? Since capacity is changing, it is not a price (or mpg) elasticity. It is an optimization problem with real life inputs. Given the new vehicle and old vehicle characteristics, what quantity mix of the vehicles will minimize fuel use and CO2 emissions? It could very well be that large, fuel inefficient cars/ trucks in the mix reduce total miles driven, fuel use, and CO2 emissions. It would mean not achieving the new CAFÉ standards, yet achieving all the end benefits. It is not difficult to imagine than in suburban and rural settings, large vehicles mean fewer vehicles per event, fewer total miles driven and less CO2 production. Does the benefit of higher mpg vehicles more than offset their possible increased usage in both miles and number of vehicles per event? Alternatively, are fuel use and CO2 emissions minimized with a combination of fuel-efficient and non-fuel efficient vehicles so that the combination does not meet CAFÉ standards? CAFÉ standards are determined by car sales and not by actual vehicle usage. Cars that are 30 percent more efficient but get used twice as much, are less environmentally friendly than fuel inefficient cars. Additionally, price increases per vehicle will make a used vehicle more attractive, in addition to less expensive new models. Moreover, dealers have more profit margin leeway to reduce used car prices to make their prices more attractive. Three times as many used cars and trucks as new ones are purchased each year. The total dollar valued of used vehicle purchases exceeds new ones and the average price of a used vehicle is about 30 percent of a new vehicle. Used vehicles are also more profitable per vehicle to dealers than new vehicles. In addition to buying cheaper models or used cars, a price increase could also shift families to do more car sharing and to own fewer vehicles per household. One fewer car may or may not reduce total miles driven by two cars in a household. The goals of Obama’s proposal are to reduce fuel consumption and CO2 emissions. However, the metric is CAFÉ standards and not actual fuel usage or emissions. CAFÉ is based on sales and not actual vehicle usage. It is not like a water meter. It is a proxy for the desirable results and as such can be achieved without actually producing the intended results at the lowest cost or with the most benefit. Inputs of real life usage of vehicles under different situations into an optimization model are needed to see what combination of vehicles, old and new, efficient and inefficient, will produce the minimum fuel use and emissions. Just using economics and engineering could produce results that meet CAFÉ, but do not achieve the intended objectives. if the point is to get people to use less gasoline, why not just tax gasoline at a higher rate? then people would choose to purchase more fuel efficient cars. I don’t agree that people are generally willing to pay more for a fuel efficient car. Is a Ford Expedition nominally cheaper than a Ford Focus? I also think there’s one argument that this post has not addressed. The CAFE standard has distorted incentives for auto producers. For example, why does Ford continue to produce small passenger cars even when they lose money on the sales of those cars? When oil prices were low, auto producers made a killing on SUVs and trucks, which are high profit margin vehicles. But to meet CAFE rules they had to ensure that they sold enough small fuel efficient cars, even if that meant selling them at a loss. In good times, the automakers were able to recoup this loss on their SUV and truck sales. So when the price of oil rose, and demand for large vehicles declined, the automakers could no longer recoup those losses. This is much ado about very little in the grand scheme of things. Baseline has had almost nothing to say about the auto deal arranged by the Obama people that will transfer ownership of a major American manufacturer to Fiat, an Italian Company. Chrysler will become much like a Japanese or South Korean “transplant” – producing some cars here, but having policies and strategies set from abroad. Only in this case, the U.s. provides the factories, the trained work force, the dealer network, and much of the financing. Doesn’t his kind of highly questionable plan deserve at least as much examination by “baseline”as CAFE Standards and comments by your readers? I think we should apply the same logic to all businesses. For example, all clothing should be “climate adaptive”. We must eliminate by the year 2030, all “seasonal clothes”. “Winter” and “Summer” clothing should become one. This will not only save time for consumers when choosing what to wear, but will also lesson the amount of manufacturing required, thus also saving energy and lowering CO2 emissions. All food should be “health optimized”. The current so-called “pure free market” approach argues that food manufacturing should be driven by “consumer choice”. But this is absurd. Only the most highly educated can determine at any point in time what the appropriate mix of nutrients one requires. By the year 2030, food choices should be simplified into 4 standardized food complexes of protein, carbohydrates, healthy fats, and “ruffage”. This will simplify the manufacturing process, thus saving on energy costs, and free up consumer time for other things besides food shopping. This will be especially beneficial for the “obese poor”. Sports has become an enormous distraction as choices for consumers have become unmanageable. By the year 2030, we should consolidate all current sports into one “meta-sport”. A national commission on sports should be formed to determine how best to accomplish this. Admittedly, it may be difficult to blend indoor sports, such as bowling, swimming, and weight lifting, with outdoor sports, such as skiing and basketball, so perhaps this should be accomplished in 2 phases. We can mandate 1 meta-indoor sport and 1 meta-outdoor sport. Once again, this will simplify consumer choice and thus save on energy costs. Frankly, I doubt there is any part of our life that could not be improved in some way. Most of these improvements surely will help in the reduction of energy usage, thus lowering carbon emissions. After all, there is absolutely no doubt that man made CO2 emissions is an apocalyptic problem which must be addressed now. To think other wise is to be a lunatic. After all, we have countless “falsifiable” experiments proving beyond doubt that “man made” CO2 emissions causes devastating global warming. Just because these studies were not referenced by anyone at the Copenhagen Climate Council does not mean they do not exist. Have just scanned this article while getting ready for work. Like the graphs — love this blog due to the sophisticated analysis. But have you considered what CAFE will do to public safety? Small cars are deadlier, and numerous economists have shown that the death toll from CAFE and smaller cars is not trivial. I remember when CAFE was first enacted and how the automakers responded. Generally, the cars got lighter, smaller engines were used, and technology was applied-“lean-burn”, turbocharging, cylinder deactivation, etc. But the primary thing was weight reduction. At first people complained about smaller cars, and about them being underpowered, but by the mid to late 80s they had adapted rather well. If you look at the BLOAT in the size/weight of vehicles in general since 1990 you will see where most of our problem lies. Less bulk material to mfg. the cars should counterbalance the added technology to some degree. One more point: It is true that people will tend to drive more miles if they get a more efficient car, however I would argue that an artificially high dollar has much to do with this, making fuel unnaturally cheap. If we get a better balance between currencies, imported oil would become more expensive and that would be a deterrent to excessive driving and we might not need to increase fuel taxes. I find this to be emblematic of the errors in modern economic thought. You can go on for pages about how this CAFE requirement will make a Camry cost $25K or 27K, or whatever .. but I know that I bought a car back in 2005 which satisfies these requirements (a Prius) for $22K. The whole wrong-headed economic discussion depends on people not switching to simpler and cheaper options. A Prius is easy, but you can’t do your math with that … so you abuse the data until an average of $1300 is added to ever car. As if a Dodge Chager + $1300 becomes a Prius? I don’t think that’s going to work at any price. Does this create a slight paradox for a “green” driver of few miles? If they bought a clean car, in the absence of these regulations, then they produce less CO2, but don’t affect other users. Now, if they are only an occassional driver, by buying a polluting car, they reduce the amount of pollution that car creates, whilst forcing more regular drivers onto (marginally) cleaner cars. Or is that just my imagination? I’ll happily ‘attempt’ to clarify, if required. good point odograph. The tradeoff with the Camry is really going to the 4 cylinder which improves fuel economy by ~10%. Also note, the comparable 4-cylinder will be CHEAPER not more expensive than the V6. Or it is going from a Land Cruiser to a Highlander which will yield a 33 – 73% mpg improvement. The highlander hybrid is about 35k, while the land cruiser is 65k. You attach a constant dollar increase to every car which is obviously false. We have CAFE standards today, and what to they do? They cause the price of smaller cars to go down, and should push the price of larger cars up. What you can get are the guzzlers subsidizing the efficient. Because SUVs are not listed with cars, you don’t get the Highlander -> Camry effect, but unifying them could get more of that. Nice thought, but as stated, inequitable. People who only drive 5,000 miles a year would be forced to pay up front for two years’ gas. And if the point is to get people to use less gasoline, why penalize them for doing so? A higher gas tax makes more sense, but people can still only purchase what cars the industry has to sell, and we have seen how much interest an un-goaded industry shows in fuel efficiency. Do people’s driving habits change that much with the fuel economy of their car? Am I really going to move further away from work because I save $1 each way on my commute? Am I going to drive to Hilton Head instead of Wrightsville? Is the extra $24 my current 20mpg car costs for the 100 extra miles really an impediment relative to the extra 2 hours each way? Saying people will drive more paying less for gas ignores the cost of their time in the car, and the other externalities that dictate how far people drive. The argument that better fuel economy leads to greater use is specious in all but the most trivial cases. Short trips (which comprise the vast majority of vehicle miles) are taken when needed without immediate concerns about fuel economy. As for rural vehicles — even in rural areas, the vast majority of vehicle miles involve one or two passengers. Even if more vehicles are required for a few trips, optimizing for the overwhelmingly common case is a net benefit. Where is your sense of scale? Also families once managed to get around before the advent of the SUV; once again managing without one is feasible. Also, while modeling is helpful, embedding dubious assumptions like miles driven doubling with a 30% increase in fuel economy in the model will merely lead to garbage output. If there’s a different standard for each footprint, isn’t it attractive to add adornments? I suspect the footprints are quantized, but a lightweight “bumper extender” could add footprint without adding much weight, and might bump you into a higher mileage bracket. Alternatively, cars might all end up looking like an AMC Pacer. Ugh. The fuel economy argument has merit when applied to commercial traffic since, of course, business is cost-optimized. Regarding personal transport, however, I don’t think ordinary people have the inclination or will to optimize for fuel economy in their daily habits. I sure as hell don’t, except for vehicle purchases. Since CAFE standards don’t affect heavy commercial traffic, the claim that usage will increase is specious. I think in my area, southern California, people are more time-constrained than MPG-constrained. The time and congestion on long commutes already matters more than fuel costs. A Chevy Impala V8 gets close to 25 plus miles to the gallon and the V6 version close to 35 plus, why would this car be more expensive under the proposed new guidelines? In the book Eco Barons,it is stated that Stanford Ovshinsky from MIT,took a Suburban and by spending about $350-450 USD from parts purchased from a local auto parts retailer,converted that gas guzzler to 100 miles per gallon, $350-450 bucks. Unbelievable,I don’t buy this increased cost to make fuel efficient cars crap they are selling. One point I guess its not politically correct to speak on, but I will. The size of a lot of Americans dictate bigger vehicles, a lot of Americans just can’t fit into a Corolla, Honda Accord or not even a Chevy Impala. Can’t blame the manufacturers for that making vehicles to accommodate them. Clark, above, hit the main point that was completely absent from your analysis. You can’t get higher gas mileage without going smaller and lighter. This means more death. I grade your analysis as Incomplete. The correlation between weight and strength of materials isn’t the strongest. So your view that going smaller and lighter leads inevitably to more death (forgive my paraphrasing) is misguided and misleading at best, outright wrong. The energy of a 50mph impact with a car half the size is also lower than that for its heavier cousin. Not all road deaths are of people INSIDE the car. If you want a more complete analysis, you are very demanding of a blogger, any blogger. How much of this is impacted in bigger on smaller collisions, and how will that change when the overall fleet average size changes? 4-cyl Camry more efficient than 6-cyl, safety equal. Highlander probably safer than land cruiser. SUV’s are much more prone to single car accidents, esp. rollovers. Reducing the % of the fleet that is SUV would reduce weight, increase mpg, and increase safety. I honestly think I have learned more from this blog posting (and some of the insightful comments) than I learned from most college and grad school classes. As for predictions for this brave new world Obama is creating on our behalf, I would say that large SUVs will be kept on the road for 15-20 years because of this legislation. They may even be passed from parent to child, like precious commodities. Autoworkers and car dealers will be dealt a blow, but mechanics and parts suppliers for 20 year old Suburbans will make out like bandits. There is an excellent paper on this from the NHSA. My interpretation of it is that design matters, and a well-made small car is plenty safe. A well made small car is safer than the average large car. So again, shop carefully and you’ll be fine. A Prius has high MPG and 4 safety stars. A Camry Hybrid gets a bit less MPG with 5 safety stars. You choose. I’m not sure it’s that dire, but that may well be another consequence. I think we got a taste of what high gas prices will do last year, as people abandoned guzzlers in droves. But there is no doubt that there are still uses for big trucks and SUV’s. There is also no doubt that negative externalities attach to oil use. I still think a fuel tax is a better solution, as it will allow those who truly need big trucks to use them while paying their weight, or encouraging them to use them less, and encourages all drivers to drive less or get more efficient vehicles or both. Raising the CAFE standard does not address the real issue, which is that we are using too much fuel. You can waste plenty of fuel in a car that gets 35 mpg. You can drive unnecessarily, neglect to maintain your car or tires, or avoid carpooling. Higher fuel economy may actually encourage people to drive more. A gas tax makes everyone more aware and self-policing about how they drive and what kind of car they buy. $2 per gallon gas is ridiculous, and is subsidized. And any economist will tell you that if you subsidize gas use, you will get more of it. I realize that this is politically more difficult than raising CAFE standards, but that doesn’t mean we shouldn’t speak out. $4/gal gas is good! The auto industry made decisions based on over-confident (dumb?) predictions for fuel prices and US consumption patterns. The pro-tax (anti-command/control) policies have a better chance of working now than 10 years ago due to a change in expectations. OTOH, is the gas-tax approach really better? Tax-policy is a decentralized mechanism for achieving regulation. But the production decisions for vehicles are largely centralized, so either mechanism is likely to work now. There are distributional consequences, however – taxes come from somewhere. Is it better to tax gas (disincentive to drive), or tax income? OTOH, gas tax is more regressive. But roads will still need to be funded. This is implausible for at least two reasons. First, while having _some_ larger cars in the mix may help for individuals who consistently need the extra capacity, the overwhelming number of seats in cars on the highway are unoccupied. Many people drive larger vehicles (SUVs) without filling them up for the vast majority of trips, often due to a mistaken assumption they are safer (SUVs were not safer at high speeds due to rollover death risk, which outweights their improved passenger protection at low speeds; but they did/do significantly increase risks for _other_ drivers). Given consumption patterns today (let alone 2-3 years ago), it is a tremendous stretch to argue that a general decrease in vehicle size would not result in a large drop in overall fuel consumption. Second, much of the increase in fuel standards will be driven by technological improvements that will increase the cost of vehicles without reducing passenger capacity. Improved engine design (less than 1/3 of energy in gasoline is transferred to movement), lightweight composite materials, engines that shut down/restart at stoplights, electronic driving assistance, etc. Finally, one (purely economic) argument for regulation that increases vehicle costs for everyone in order to decrease gas prices involves a collective action dilemma. Specifically, if price elasticity is high (aka, a 1% increase in consumption drives a 5% increase in price), then individual-level decisions are inefficient. Any one person won’t impact overall demand. But in aggregate, the impact is significant and the savings are much larger. The CAFE standards seem to be a complicated and inefficient means to produce higher efficiency vehicles. They also seem prone to inaccuracies due to the fact that they are calculated based on past sales and not vehicle usage. Take for example a type of vehicle that is used mostly for commercial use. This will likely log more miles than the typical family sedan, however the CAFE calculation would have counted them both as one vehicle in the formula. A fuel tax would be more efficient at reducing overall fuel consumption and forcing consumer demand towards higher MPG vehicles. Has this blog ever posted a thorough analysis of the economics of a fuel tax? I am especially curious about the economic impact of a fuel tax, which funnels the increased vehicle ownership cost to the government, versus the CAFE standards which would funnel the increased cost to car manufactures and employees (part A of the diagram). A fuel tax would also likely increase the vehicle cost over time as manufacturers develop higher MPG vehicles to meet demand. Would subsidized R&D be the best use of this additional tax revenue to offset the double whammy of increased fuel and vehicle costs? Thanks. Great work on this blog. Somewhere in the midst of this saracasm seems to be a legitimate argument – which is that the government should stay out of the private sector because it tends to do stupid things. That argument is hypocritical in the extreme when applied to automakers due to the extreme legal protections they enjoy. If US citizens were allowed standing to sue (individually and in class action) US automakers in private court for wrongful damages (and the govt. regulations that effectively override liability law were retroactively removed), the industry could be dead within a year. Anti-regulation folks seem to hate regulation when it limits business, but love it when it protects business from consumer legal recourse. Strangely, the anti-regulation folks also seem to be the anti-litigation folks. Besides, it’s hard to imagine govt. being any dumber than GM. A few years ago I did a statistical study on accident fatality rates between “Light Trucks” and cars, based on NTSB accident data. NTSB defined light trucks to include SUVs and minivans. Essentially, passengers and drivers in light trucks die at a higher statistically significant rate then car drivers and passengers. Even when you include mini-vans in the light truck data. Essentially the HUGE installed base of older SUVs that are exempt from the roll-over passive safety standards and the active safety standards means people die at a higher rate despite the more massive bodies. Simply saying that smaller cars are more dangerous is too simplistic an assumption. This view is plainly wrong and entirely fictional. I suspect it was concocted by self-serving SUV salesforces. In truth, SUVs are more dangerous due to rollovers, which account for a large fraction of vehicular deaths. Their higher vertical profile and weight not only makes them less safe for occupants due to rollovers, but also for other cars due to collision. The public safety arguments against SUVs are overwhelming. However, there are significant public safety arguments that can be martialed _for_ mid-size and full-size low-riding vehicles; I am not familiar enough with the material and design tradeoffs for these to speak competently about them, however. Thank you for help killing this myth. The misperception of SUV safety has resulted in thousands of deaths over the years, and many more serious injuries. I really liked your micro-economic analysis of the CAFE standards. The one thing that puzzled me was the opposition of the standards by the car industry. 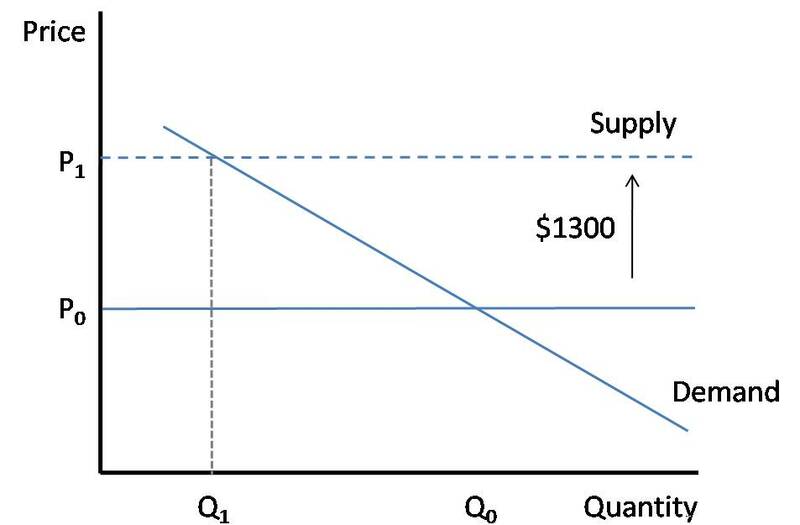 Typically, when a government tax reduces the supply below the equilibrium point (if original market is assumed to be competitive), the producer surplus increases. So why did the automakers oppose the standards over all these years? Another point in favor of a fuel tax that I forgot to mention earlier is the immediacy of the effect. Raising CAFE standards will not do anything to affect the millions of cars currently on the road. A gas tax will have an effect now, and have an effect on everyone. Much of the pollution is unremediated. The pollution rasise health risks. This is a market failure. To the extent that higher CAFE standards produce lower air pollution, these risks are diminished. So, the costs of higher CAFE standards are a reasonable Pigouvian solution to a market failure which causes ill health. Do a risk analysis on the savings in health care costs and you may see that the $1,300 is well spent. NHTSA does estimate the impact of better gas mileage on driving miles. That doesn’t, however, mean that a gas tax wouldn’t be more effective. As a historical point, most government regulation of business, at least in the 19th and early 20th centuries, was implemented at the request of business – most often entrenched interests trying to protect themselves against innovators. Good analysis. Can I point out that we only get this argument about CAFE standards. There is much less argument about other energy/efficiency standards such as SEER standards for furnaces and air conditioners, hot water heaters, gpf standards for toilets, etc. These standards are supported by our electric coops, because conservation is cheaper than purchasing more electric or building new generating capacity. Standards are necessary to keep energy pigs from sponging off the investments of others. High gas prices change the mix of cars purchased. People stop buying gas guzzlers, and the prices for used gas guzzlers have tanked. People don’t rush out and buy new cars because their transportation budget has been sucked up by record oil profits That said, high gas prices can maintain support for CAFE standards. Carter got CAFE standards because of gas station lines and high prices. Interest waned after oil consumption dropped by over 20% and prices dropped. Maintaining upward pressure on gas prices would lower interest in purchasing gas guzzlers. The EPA draft document concludes that motor vehicles could be even more fuel efficient than currently required by law. Based on advanced technologies such as plug-in hybrid vehicles, fuel efficiency could be improved to well above 35 miles per gallon between 2020 and 2025, it says. A 2007 energy law that has been supported by the Bush administration mandates an average vehicle fuel-efficiency of 35 miles per gallon by 2020. For other sectors, the EPA draft document shows how emissions such as carbon dioxide could be regulated through the government-permit process and through a cap-and-trade system similar to the programs the agency administers for acid rain and mercury. “The net benefit to society could be in excess of $2 trillion,” according to the draft document. What would be really interesting is to analyze their $2 trillion estimate. It sounds like enough to pay for TARP. The primary disadvantage to a fuel tax is its regressive structure. It’s not even proportional taxation. Also, immediate implementation (along with obvious benefits) does create unanticipated economic shocks. A better approach might be a phased-in tax increase, which gives consumers and businesses some lead time to plan for the change and alter their behavior accordingly. Having said that, I do agree with your ranking of solutions. 1) Sunk costs. The US had invested significant plant/training in heavy vehicles. Regulations reduced the value of past investments and/or required new investments. Production lines for autos can easily have paybacks of 5+ years. 2) Market structure and competitive advantage. If it were _just_ the US companies, they might have been less opposed to cafe. However, US companies recovered from the Japanese onslaught by focusing on a new market segment (for SUVs and light trucks) that emerged as gas prices plummeted during the 1980s strong dollar era. A cafe standard would have harmed the US companies relatively more than competitors who built better small cars (and had brands that owned the small car space). US companies consistently and deliberately positioned themselves in the big car space. Defenders of the big three have argued this is because they could not make money on small cars (because their labor costs exceeded foreign comapnies) and therefore needed to focus on the more profitable large vehicle segments. These defenders will also note that the Big Three even delivered some small cars below total average cost in order to allow their fleet to meet CAFE standards. So if I were an apologist for US automakers, I would say that unions drove up their costs of production to the point that they could only make money on profitable big cars and SUVs. Thus, CAFE forced US automakers to sell small cars at a loss in order to permit sales of big profitable cars. Except it wasn’t so much labor rate costs, as health care costs and legacy costs (Japan has universal health care, and cost is lower per person in any case). And this makes no mention of the competitive mess caused by dealer proliferation (and the out-of-control franchise system). And the incredible ignorance, short term focus, and arrogance the big 3 exhibited for 30 straight years. And, of course, US consumers. The problem is that the $1300 will NOT be the consumer’s choice, and it might not be $1300. It might be in horrible performance – you simply won’t buy the underpowered car (or truck). You can’t repeal physics. The US (and Candadian) car companies make profits and very good larger cars. Others are better (profitable) making small and efficient cars. Instead of letting each manufacturer concentrate at what they do well, the law is trying to force every manufacturer to have the same average efficiency on very different products. Think if you wanted to force Toyota or Honda to create a hybrid 12+ passenger van – something they have never made and have no engineering experience. Or build large trucks or something else. Or force Microsoft to create a version of Windows for cell phones – corporate average code economy. It will cost jobs, result in bad products, and hurt profits. The new vehicle might be something you would buy, but you cannot force it down every consumer’s throat. Or you (and everyone else) will simply buy the similar vehicle from a more experienced (foreign) manufacturer bankrupting the US company. You can’t make Ford be Toyota or Toyota be Ford, but that seems to be what you want. I disagree. With stringent CAFE standards it *increases* manufacturer’s visibility into what they need to invest in, while at the same time placing more pressure on them to innovate and compete with others subject to the same rules. It makes taking the easy and lazy way out of humongous and inefficient autos in bubble times and bail outs during bust times not as viable an option. It’s a more stable long-term policy. I drive an Opel Zafira with 7 seaats. I bought it (new) for 15.500 Euros and it gets 33 mpg on real measured average. And this is European technology from 2001. Are Americans not capable to do the same. Obama evidently thinks they are not, otherwise he would have proposed some stricter standards. oh, come on! you just like your big indestructible truck, don’t you? Why would smaller cars be significantly more dangerous? When private sector entities do stupid things, they get punished for it–unless moral hazard actions by government saves the day. That “punishment” tends to happen quickly, freeing up resources for the next entrepreneurial bet. When government does stupid things, it just continues to do them (Amtrak is a terrific example, as are the current auto industry bailouts–which I oppose) without consequences. The consequences are diffused like a mild poison gas in “space and time”. When countless of these actions are repeated, the “mild poison gas” compounds and becomes extremely toxic. The result can be “instant death”—witness the extreme of such cases, the Soviet Union. Pingback: Why Are SUVs More Profitable?